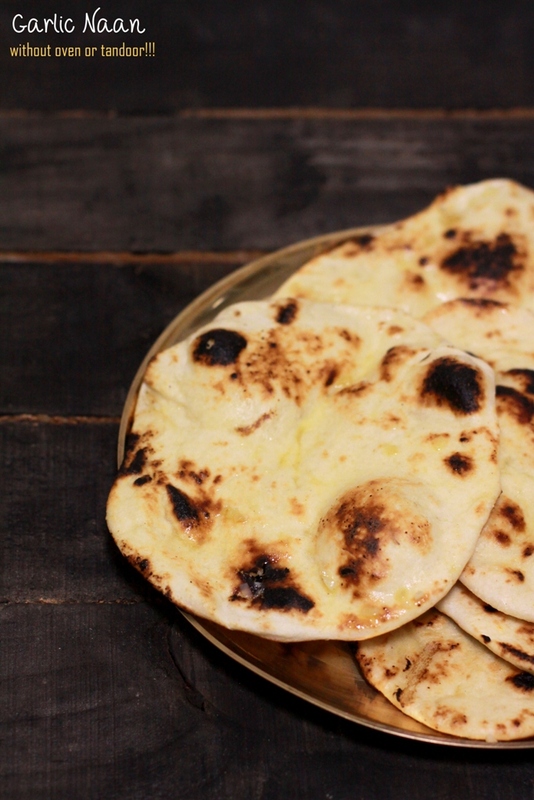 Something that I’m always scared of making at home – “Garlic Naan”. Well, the main reason behind that is… We love garlic naans and those at the restaurants are extremely soft yet crispy in texture! Huh… When hubby loves it like anything, ek try to banta hai! Mix yeast, warm water, sugar in a small bowl and let it rest for 5-7 mins so that yeast gets activated. Sieve flour and salt together and make a well in center. Pour the yeast mix, add 2 tsp minced garlic and knead a soft dough. Dough will be sticky initially but transfer it to a flat floured surface and knead it well for 7-8 mins. Put it in a greased bowl and cover with a damp cloth. Keep it in a warm corner (or in microwave – turned off) for at least 2 hours or until it gets doubled. Punch down the dough to remove air pockets and then divide it in 4 equal balls. Roll them out (with no pressure at all) and apply water on one side of it. Heat tawa on high flame and carefully put the wet surface onto it. Hold the tawa upside down, keeping 3-4 inches distance from the flame and rotate in circular motion until you find it cooked with brown spots/bubbles on top. Place the tawa back on heat and let it cook for a min. Brush with garlic butter generously before serving!!! Hey! That is quite a trick. I use an iron tava and this should work beautifully. That sounds great – and it stays stuck to the tawa??? looks so good! bookmarking dear! Upside down iron pan? Genius!